The device manual is part of the product and contains the information necessary for installation and for safe operation. 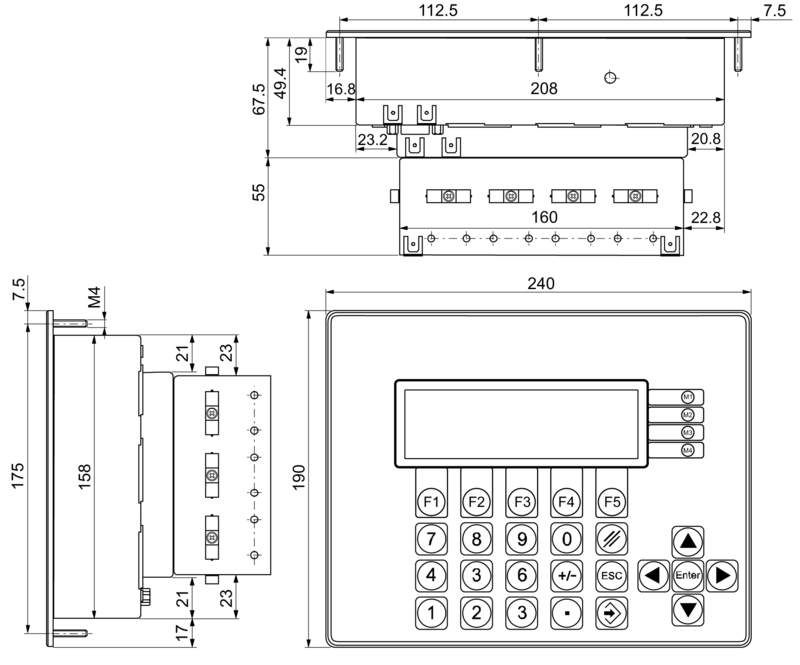 Information on the operation of the device, the system parameters that can be programmed for configuration of the CompactController and the axes controlled, on the PC parameter editor supplied and on the proprietary serial LB2 protocol is contained in the reference manual that is included on the installation CD in electronic form as a PDF file. 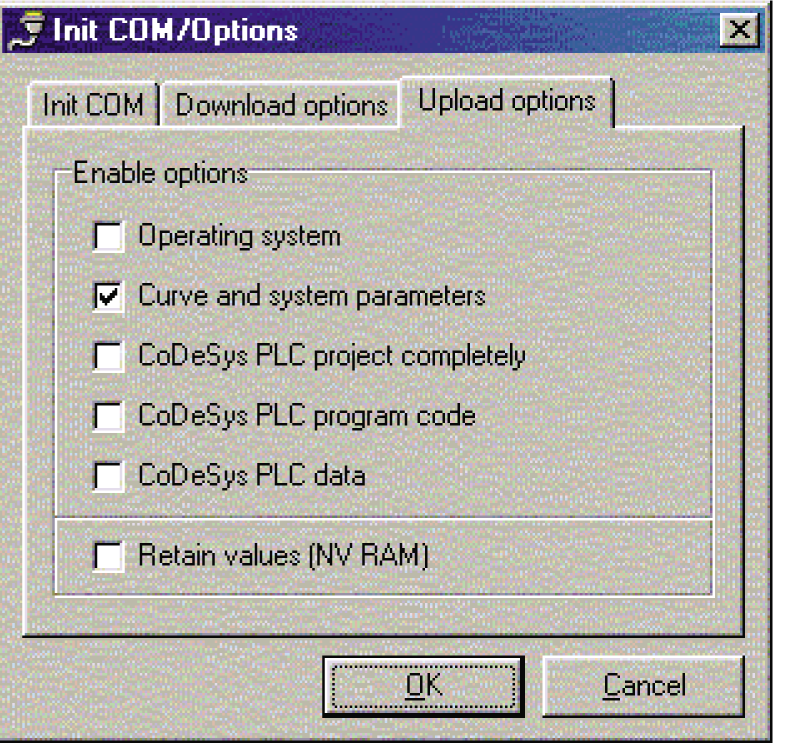 Descriptions of any pre-installed PLC program and of the library functions for writing custom programs are not covered here; the comments in the individual function blocks contain appropriate instructions on how to use them. Carefully read the documents provided prior to the installation and usage of the device. Keep the documentation for the service life of the product. Ensure the necessary documentation is available to the personnel at all times. Pass the documentation on to the subsequent owner or user of the product. Add all supplements provided by the manufacturer of the device. Read and follow the information in the documentation to prevent damage to the product and malfunctions. This manual is applicable to the standard version of the product. This includes all types that are n o t marked with a Y after the product number in the type code. A product marked with a Y is a customer-specific version with customised features and/ or modified technical specifications. Depending on the customer-specific modification, further documents or other documents may be applicable. The device manual is aimed at operating companies, machine manufacturers and qualified specialist staff. Personnel must have adequate knowledge on how to handle components that are sus- ceptible to electrostatic. They must also be familiar with and follow national health and safety regulations. The operating company must ensure that the safety instructions in this manual are followed and that all individuals tasked with working on the CompactController have read and understood the manual. Dangerous situation: There is a risk of injury on failure to follow the in- structions! The operating software for the CompactController permits on-line changes to system parameters during operation to make it easier to set up the plant and to make service visits easier. Ensuring adequate protective measures as well as limit switches and emergen- cy stop buttons are provided. Do not disconnect any connectors or any screen connection with the device switched on to avoid the occurrence of uncontrolled states. Prior to updating the operating system, switch off the power circuits for the drives controlled by the CompactController. 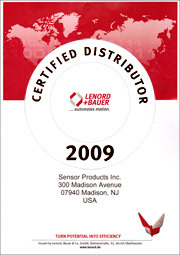 The CompactController is only intended to be used for controlling and regulating drives in the industrial sector. On operation in residential, business and commercial sectors compliance with the requirements on electromagnetic emissions in accordance EN 61000-6-3 is to be ensured with additional external screening and filtering measures. The PLC functionality makes it possible to execute customer control programs or control programs supplied using the function implemented in the operating system for controlling drives. 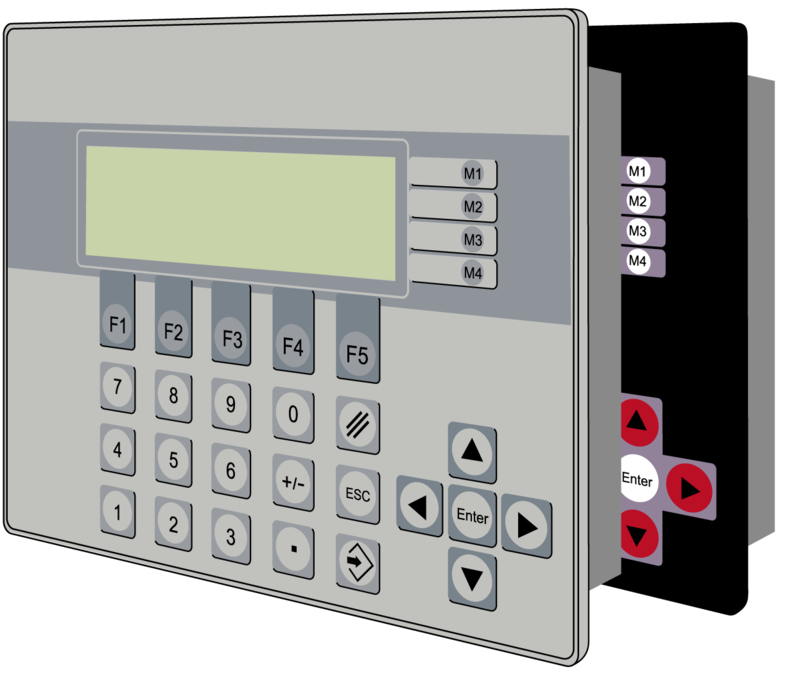 The display and the keyboard make it possible, with appropriate programming, to use the CompactController as an operator terminal for controlling operating states. The devices are configured using system parameters. This action is undertaken either on the device itself, via the PC editor software BB2100K supplied or via a loaded PLC program. The data and information given in this manual are to be followed. 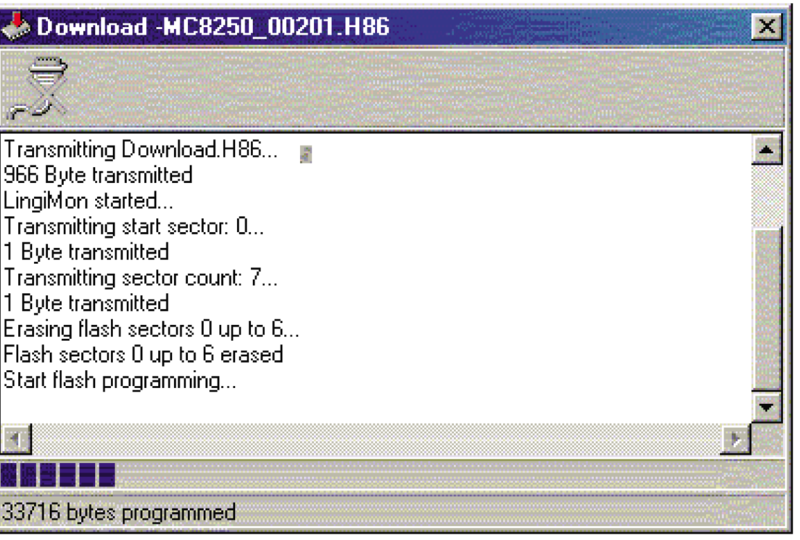 The CD has an autorun program that provides information and various possible options in a dialog box after the insertion of the CD, provided the autorun function is activated on the PC. If the CD does not start automatically, you can start the installation manually by running the program start.exe in the root folder on the CD. The rating plate is bonded to the side on the connection frame. The function of the display is dependent on the CompactController operating system and any software expansions loaded. There is a corresponding description in the reference manual. Make the necessary control panel cut-out and fastening bores in the required po- sition in the switch cabinet. Insert the device in the control panel. Fasten the device using 6 nuts M4, spring washers and washers. Make the electrical connections taking into account the information in section 5. Fit the cover and fasten the 4 knurled screws. Fix the cable to the connection frame and to the cover itself with the aid of the clamps. For brief removal of the CompactController undo the four knurled screws in the cover (are captive in the cover) and disconnect all connectors. After refitting the cover first press on the knurled screws and then tighten them. 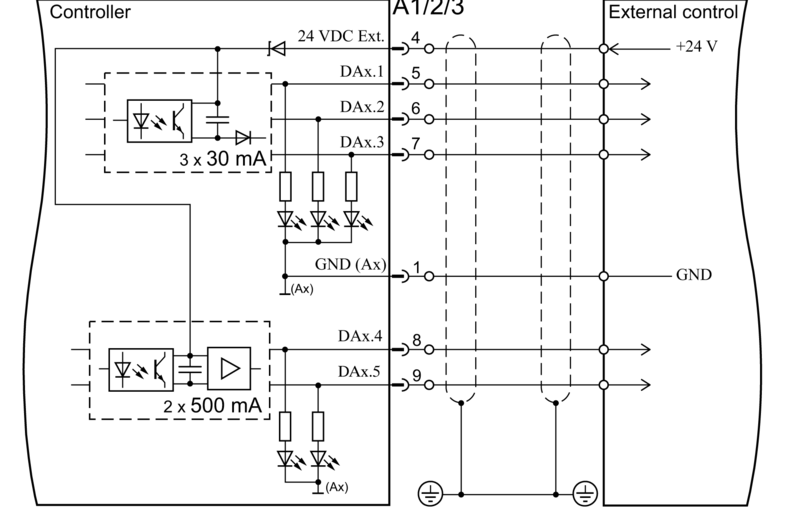 The CompactController can be upgraded at a later date with a function module (field bus). The installation, the connections and other information on the module are described in a separate document (also on the CD supplied in electronic form). Communication with the extension modules is via a PLC program using CoDeSys function blocks provided. The basic configuration is undertaken using various system parameters (→reference manual). 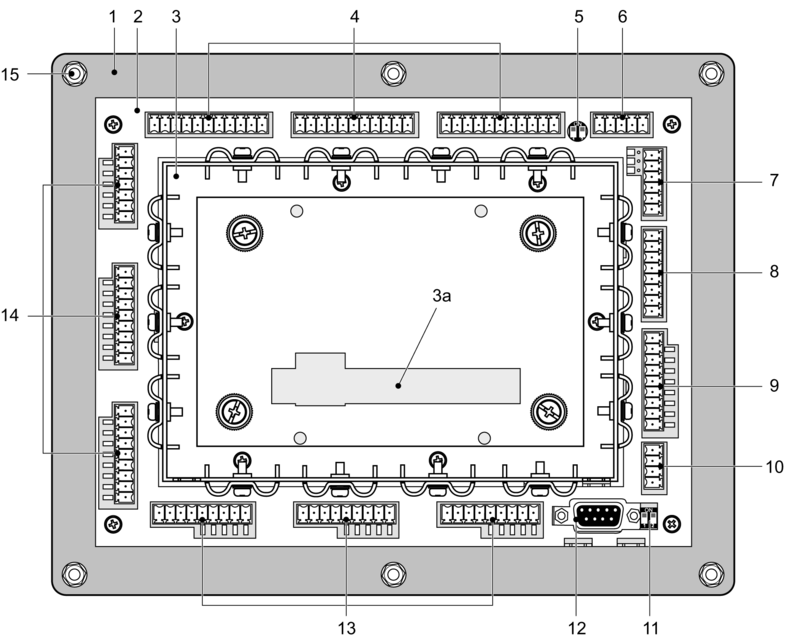 cross-section is 1.5 mm2 (incl. bush). To tighten the terminal screws (M2) use a screwdriver with a 0.4x2.5 mm blade. Ensure that external protection measures against surges have been implemented (EN 61000-4-5). Do not disconnect any connectors or any screen connection while the device is switched on. 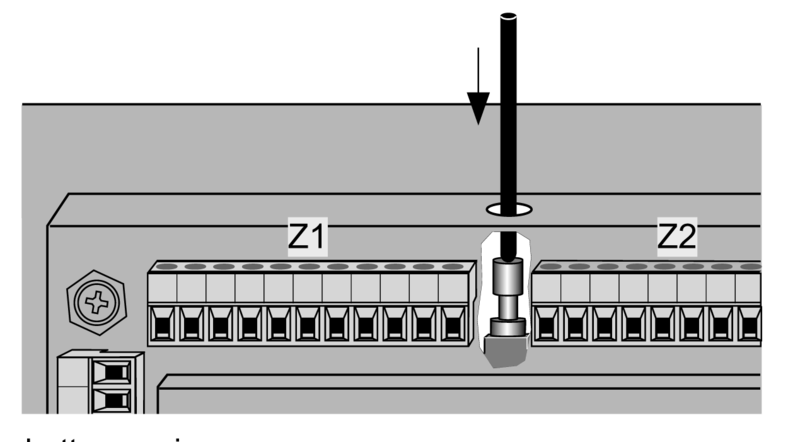 supply of encoders connected (UZ) is provided at terminal strip V.
3 and 4 as well as 1 and 2 must be connected together as shown dotted in the figure. 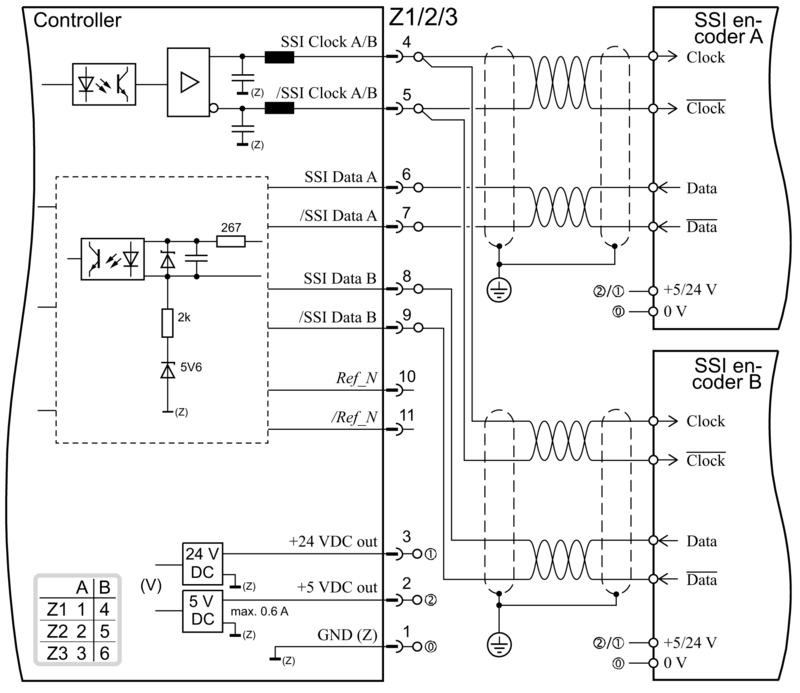 Two independent serial interfaces are available on connector C1: COM 1 and COM 2. 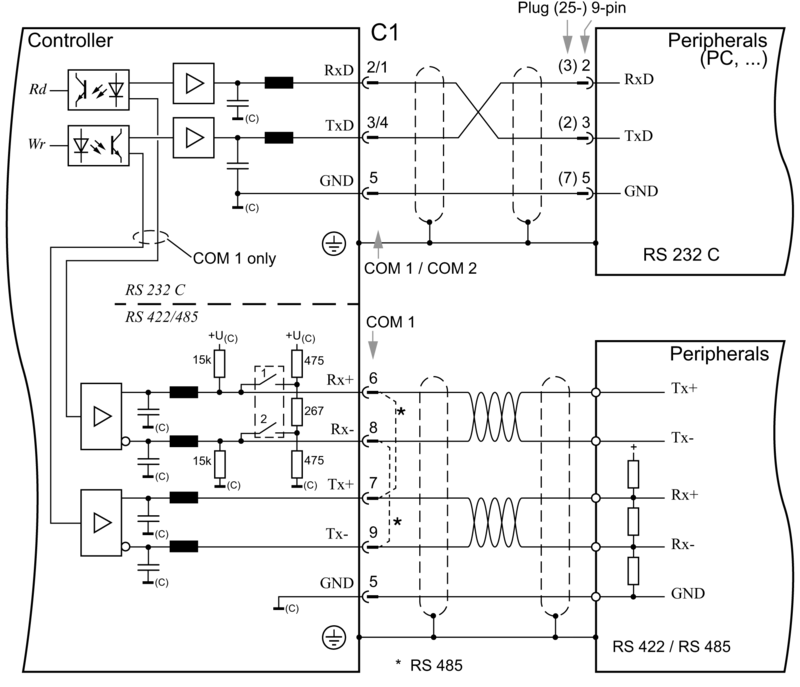 COM 2 is designed as pure RS 232 C.
COM 1 can be used either as RS 232 C or as RS 422/485. 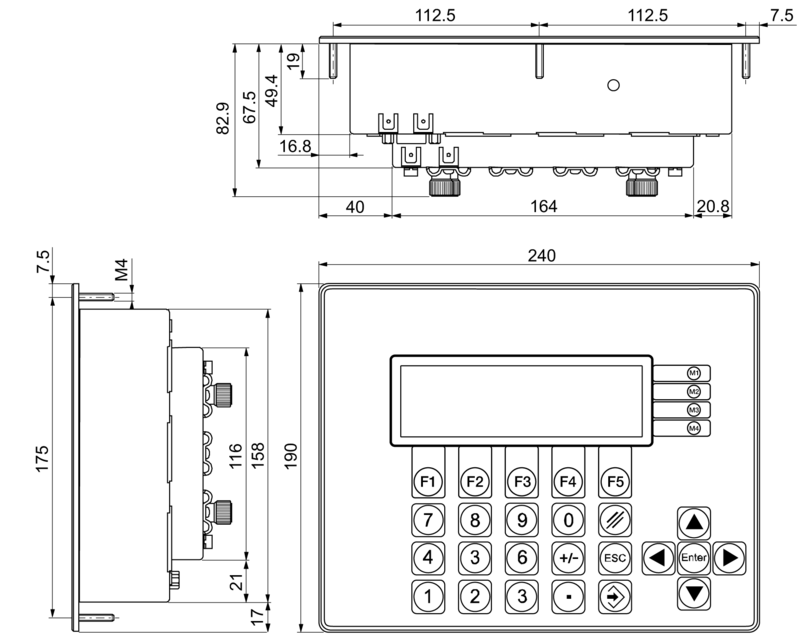 The serial interfaces have the same earth potential as the CAN buses (connector C2). jumpers (shown dotted in the figure). 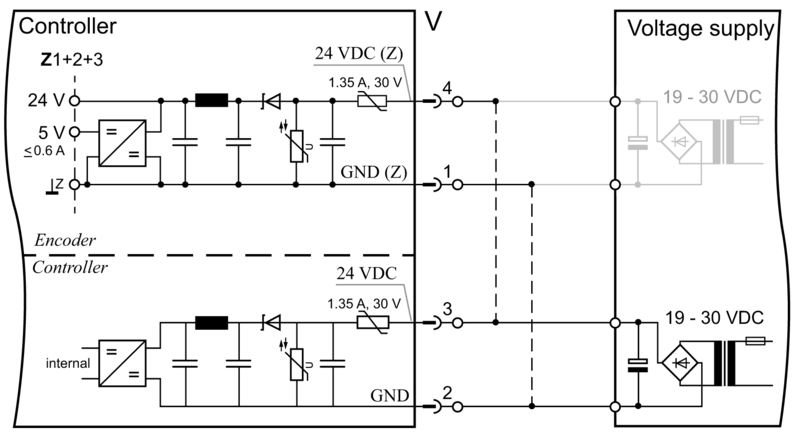 Two CAN bus interfaces are available on terminal strip C2: CAN1 and CAN2. 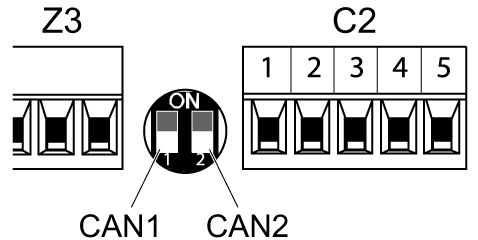 connector: Switch in ON position. The terminating resistance is approx. 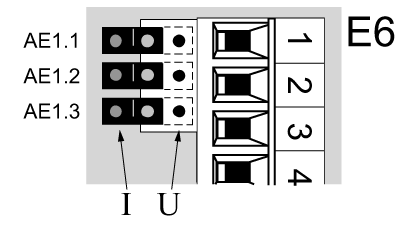 The CAN buses have the same earth potential as the other serial interfaces (connector C1). 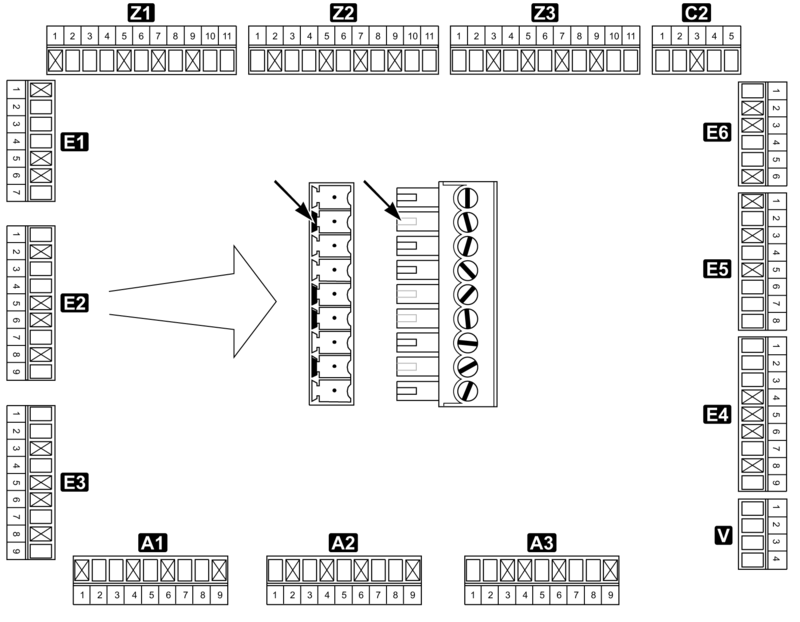 2 SSI encoders can be connected to each of the terminal strips Z1 to Z3 . All encoder inputs have the same earth potential. diodes underneath the related terminal (on = high). 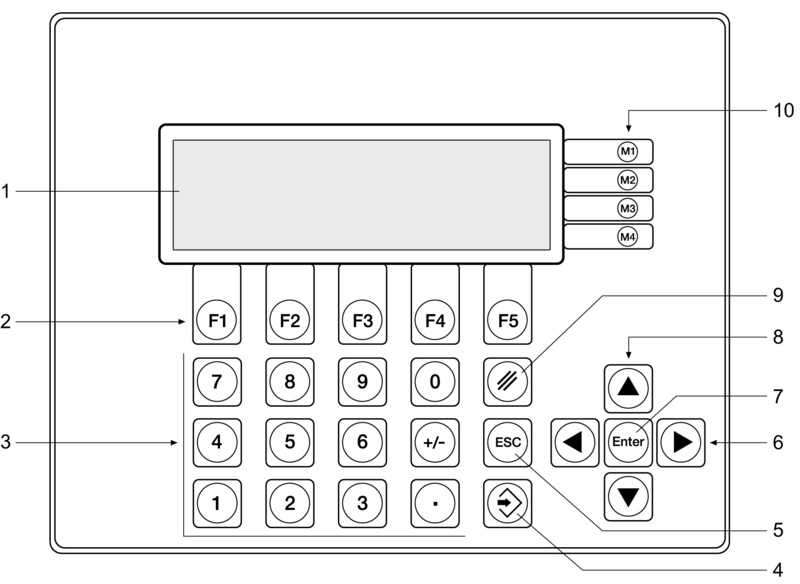 – voltages 0 – 10 V.
A jumper is provided for this purpose beside the terminal strip for each of the max. 3 inputs. 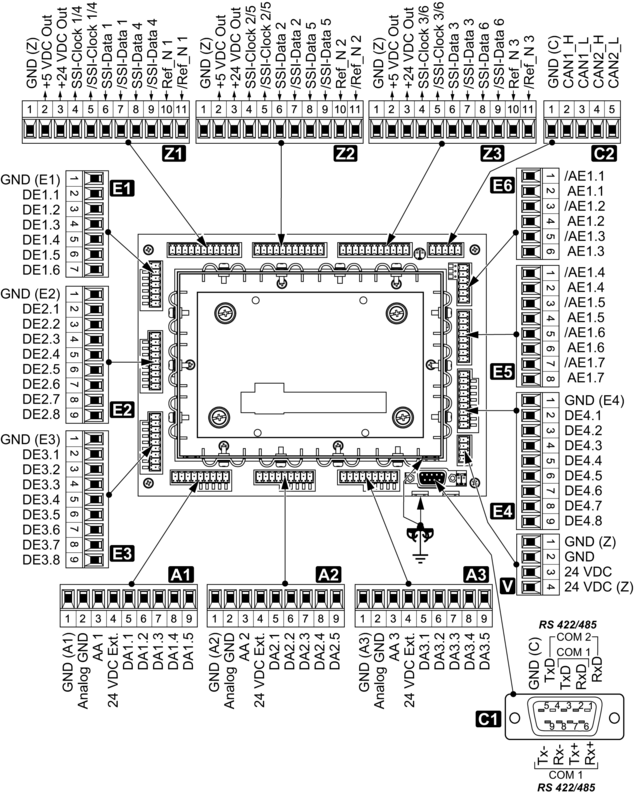 The measuring ranges are converted internally to a value range from 0...255 (1 byte). resistors in the range from -40 °C to +215 °C. 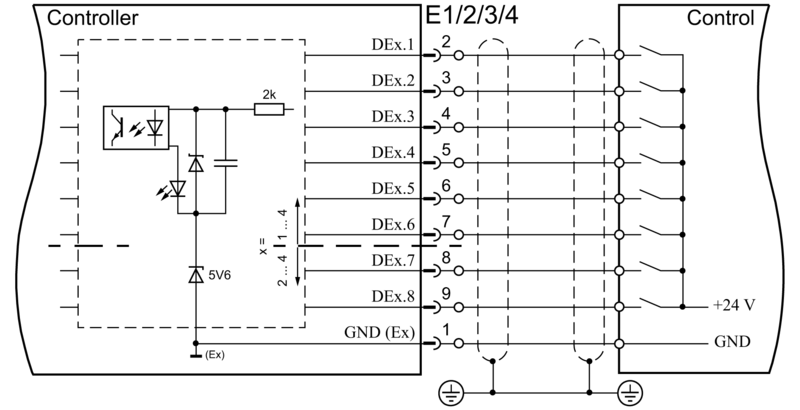 The measuring range is converted internally to a digital value range from 0 to 255 (1 byte). The digital outputs on a terminal strip each have a separate earth potential. 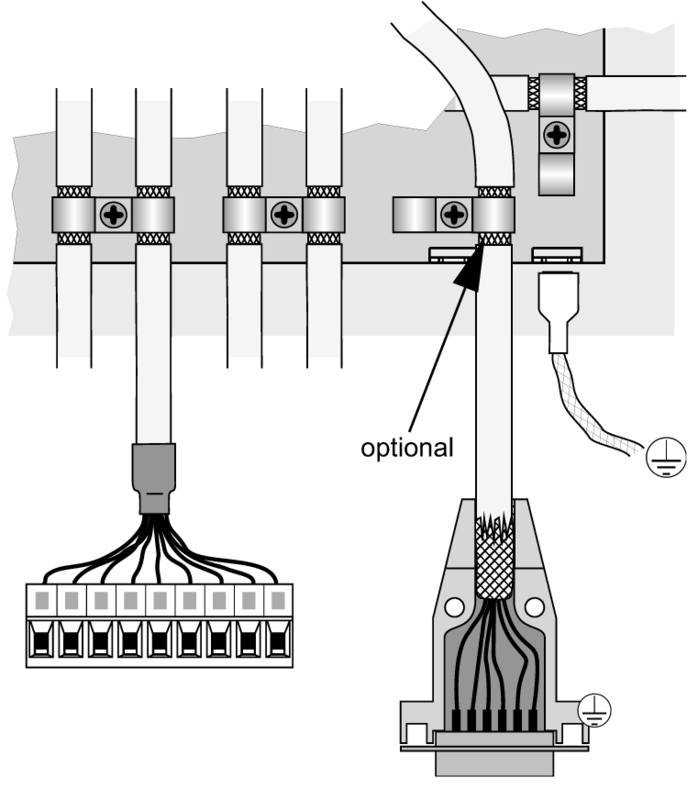 The minus connections for the analogue outputs are connected together. The signal state on the digital outputs is indicated by red light emitting diodes under- neath the related terminal (on = high). After switching on and a short initialisation process, specific changes can be made to the CompactController and the axes to be controlled using the system parameters de- scribed in the reference manual. After setting all axis-related control parameters, the drives can be moved manually us- ing the keyboard on the Controller. To install LingiMon, start the program LingiMonSetup.exe on the CD or simply click the related menu command in the CD autorun program. The application will now be installed in the usual manner for Windows (it is possible to change the folders to suit specific needs). "Do you really want to remove the selected application and all its components?" LingiMonSetup must then be started again for a new installation. After installation start the program either via the Windows Start menu or by using the left mouse button to double-click a binary file with the extension '.h86' or '.b86' in Windows-Explorer. Using a null modem cable establish a connection between the PC (RS 232 C: COM1/2) and the CompactController (connector C1). In the program select the COM port used (to be set via the connector icon). Baud) as well as type of file loaded. Prior to transmitting the data to the flash memory on the device, this memory is first cleared. In general it is sufficient to clear only the operating system area as per the default in the program. Then any existing PLC program and the system parameter settings will be retained. The other option can be enabled in the Download options (click connector icon). ceasing to respond. In such a case repeat the transmission. 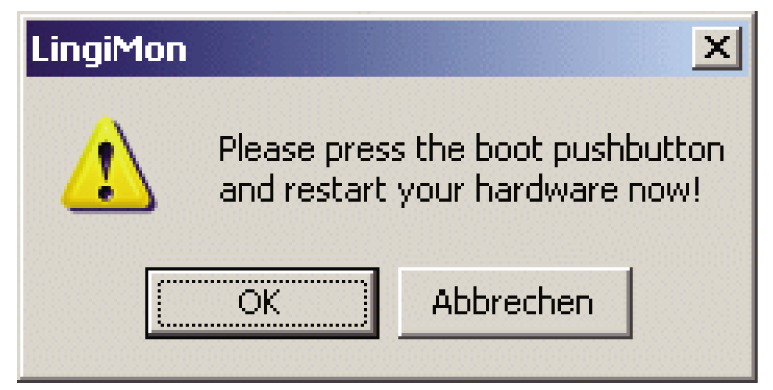 After confirming using OK, the program will prompt you to reset the device. 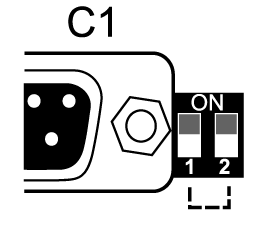 Press the miniature button in the housing as per the following figure using a non-metallic object (e.g. match) and switch the device back on. The CompactController is now ready for the download (only one or more lines can be seen on the display). At the end of the (successful) transmission the CompactController switches to normal operation. If not, repeat the transmission process possibly with a reduced transmission rate. 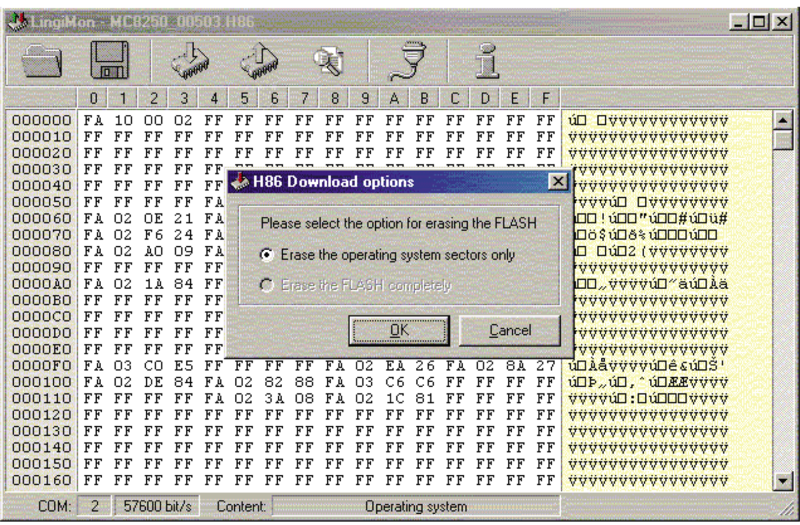 The contents of the complete flash memory or only parts of the memory can also be uploaded i.e. read and saved in a file with the extension '.b86'. This file can be written back again at any time – as explained above (backup function). The name of the file is generated automatically by the option selected, but can be changed if necessary. Upload options (click connector icon).